Pro-confederate protestors came to show their support for monuments commemorating Confederate soldiers in Richmond. They were outnumbered by counter-protestors gathered at Robert E. Lee statue this morning, Saturday, May 5, 2018. Photo by Erin Edgerton. 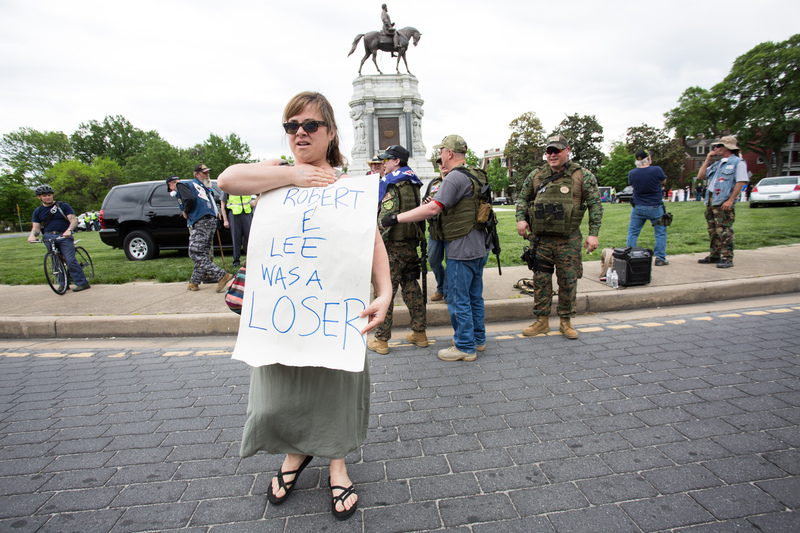 RICHMOND – Fewer than 10 members of a pro-Confederate group were outnumbered by several dozen counterprotesters at a rally at the Robert E. Lee statue on Monument Avenue on Saturday. 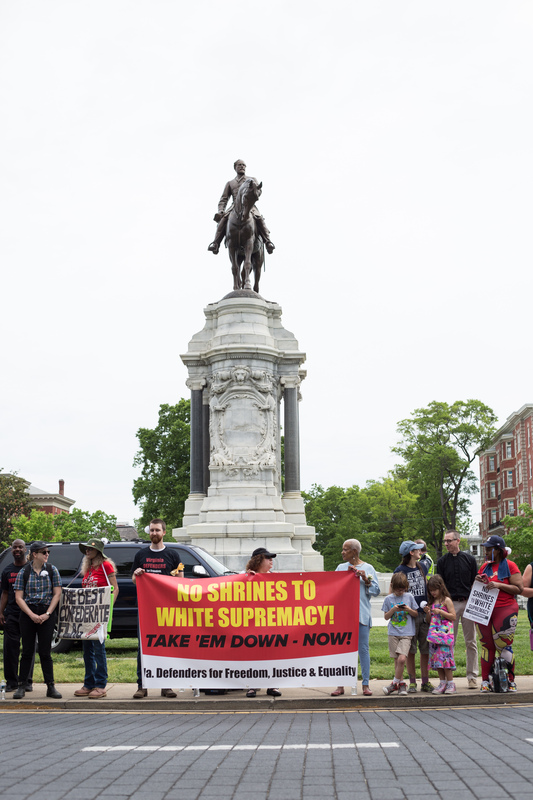 It was the third time the group, called CSA II: The New Confederate States of America, has rallied in support of the statues commemorating Confederate figures in Richmond. The Tennessee-based group’s previous appearances have drawn a sizeable presence of local and state police and counterdemonstrators – and Saturday’s rally was no exception. Several hours later, a counterprotester stomping on an American flag drew the ire of some pro-Confederate demonstrators, who began yelling at their counterparts across the street. Joseph Rodgers, a resident of Richmond’s East End, addressed those who gathered to protest against the pro-Confederate group, saying the statues represent the worst values in America. Lisa Leichssenring, a Ruther Glen resident, said the statues send a message that Richmond is not a city for all people. “It’s a slap in the face for people of color to see those people memorialized,” Leichssenring said. Civil War re-enactor Jim Callear, a Powhatan resident, was with the pro-Confederate group. He said he disagrees with the notion that the statues are racist. 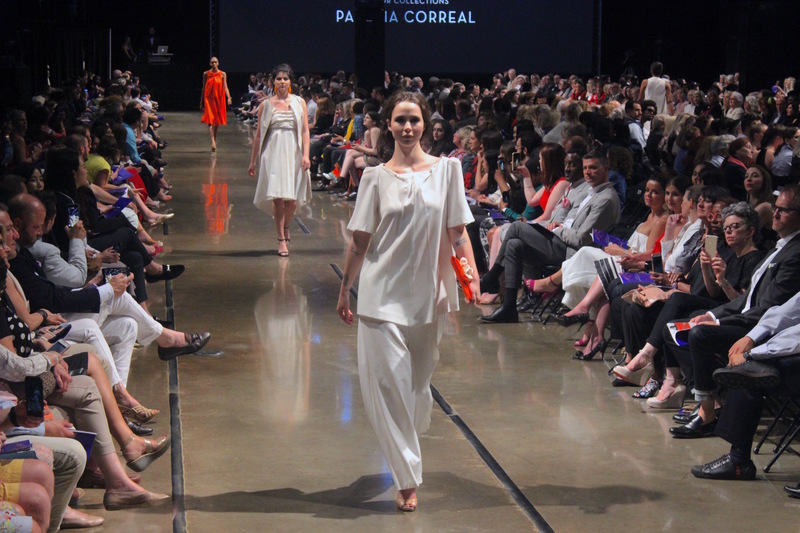 They represent a piece of American history, Callear said. The conversation surrounding the statues memorializing Confederate leaders has been contentious around the country for several years. It reached a flashpoint at last summer’s “Unite the Right” rally in Charlottesville, in which a counterprotester was killed in a car attack. In Richmond, Mayor Levar Stoney appointed a commission to recommend what to do with the five statues of Confederate figures on Monument Avenue. Stoney originally said the commission would look for ways to add context to the statues. But after the demonstration in Charlottesville, the mayor broadened the panel’s scope to include considering removal of the monuments. The group came to show their support for monuments commemorating Confederate soldiers in Richmond. They were outnumbered by counter-protesters. Photo by Erin Edgerton. But Ron Bell, a Prince George County resident, said he sees no reason to take down statues. He doesn’t believe that doing so would do anything to combat racism. Bell said he found out last year that he is a distant relative of Robert E. Lee. For that reason, he said, the statue holds unique importance to him and represents his heritage. It’s why he said he decided to show support for keeping it up. The Monument Avenue Commission will hold public meetings from 6 to 8:30 p.m. on Thursday at the Richmond Public Library and from 10 a.m. to 12:30 p.m.on May 19 at Martin Luther King Jr. Middle School. The commission will review comments from members of the community at the events, according to a news release. This story is for subscribers to VCU’s Capital News Service. If you have questions or comments, contact Jeff South at jcsouth@vcu.edu or 804-519-1062; Karen McIntyre at kemcintyre@vcu.edu or 530-448-4638; or Tom Kapsidelis at tpkapsidelis@vcu.edu or 804-869-5263.